On May 13, 2016, Medford Township Public Schools in Medford, N.J., was honored by the U.S. Environmental Protection Agency (EPA) with its highest public recognition for extensive environmental initiatives. Under the guidance of their Director of Operations and Technology, Joe Biluck, the school system has taken aggressive steps in a number of areas to develop a sustainable and renewable environment for students and faculty. Each year, the EPA honors individuals and organizations from several states and territories for their contributions to improving the environment during the previous year. Recognition for the school system's sustainable achievements resulted from the application of bio-based traffic paint, BioStripe®, and Reichhold’s Beckosol AQ510 alkyd latex resin blacktop sealer. Both of these award-winning products have been recognized as USDA Certified Biobased formulations. As the educational part of the project, seventh and eighth-grade students conducted tests for durability and appearance. The sustainable striping material, BioStripe®, was chosen for the project because of its low-VOC (volatile organic compound) composition, durability and attractiveness. BioStripe® is uniquely produced using soybean oils rather than harmful petroleum-based materials. Further positive news is that BioStripe® is very easily renewable since it is made out of soy beans, a crop that is widely grown and harvested throughout the world. 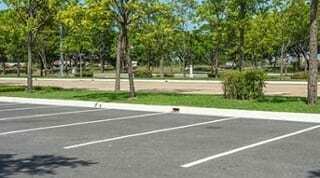 BioStripe® is the first water-borne traffic paint available and comes in several standard colors for parking lot and pathway markings. Similar to the BioStripe® approach, Reichhold has committed to developing eco-friendly paving and sealing products produced from soy materials rather than petroleum. In the student-run testing, the soy-based sealer was applied and compared to asphalt and three other non-biobased materials. This testing of all five products was intended to determine their durability and retained attractiveness. At the end of the test, the students found that the biobased Beckosol had performed better and retained its appearance longer than the four non-biobased products. The Medford (NJ) School System had already participated in a number of exceptional projects to support sustainability. Prior to the award-winning parking lot tests, the system had worked with bio-diesel and other initiatives including a solar-electric generation system and geothermal HVAC system. Clearly the students in Medford are being exposed to a positive, environmentally friendly environment and education. What types of sustainability initiatives does your organization implement? Share your “go green” strategies with us in the comments!